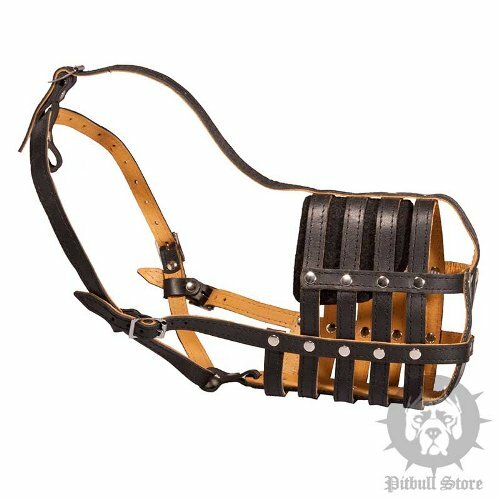 Are you in search of a high-quality leather Pitbull muzzle? 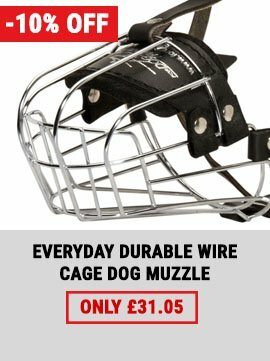 This mesh muzzle by Fordogtrainers is the most suitable for your dog! The muzzle looks like a basket muzzle from plastic or metal, but it is much more convenient because we selected supple leather and lined the muzzle with soft Nappa inside. Our muzzle protects from biting, eating and picking up from the ground. 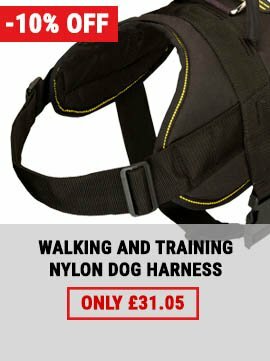 It is suitable for walking, training, vet visiting and traveling. We have EMS-Express shipping (3-6 business days) and Registered shipping (6-12 business days) and deliver our products over the world. Contact us and our customer support team will send you the most suitable muzzle and will answer your questions. You can always return or exchange the product if it doesn't fit your Pitbull. There are special discounts and proposals for our loyal customers. 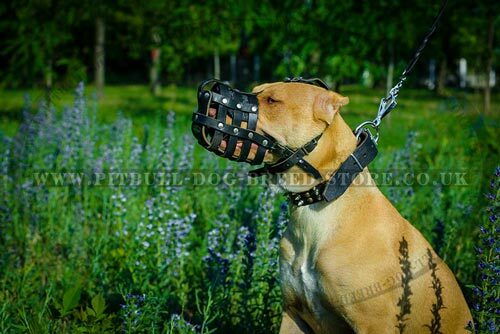 You will get the muzzle, which is chosen according to your Pitbull sizes. Bulk customers can test our products after order payment. Thank you. The product is super, leather is good and soft. The muzzle fits perfectly. To see more detailed instructions how to size up your Pitbull - Click here. Most of leather muzzles are too coarse and closed for Pitbull to breath with comfort! But not this one! 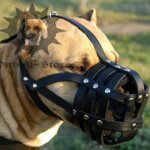 This leather muzzle provides the highest comfort for your dog. 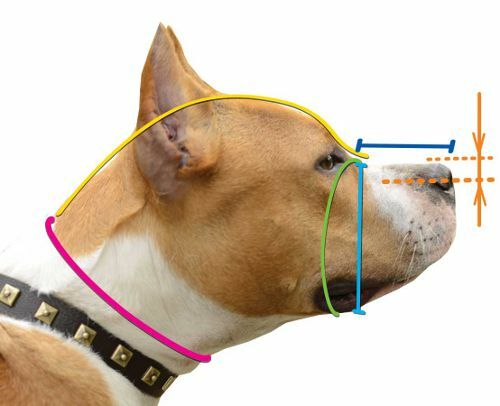 The Pitbull muzzle doesn't tighten dog's jaws so it can open its mouth, pant and lick its nose. 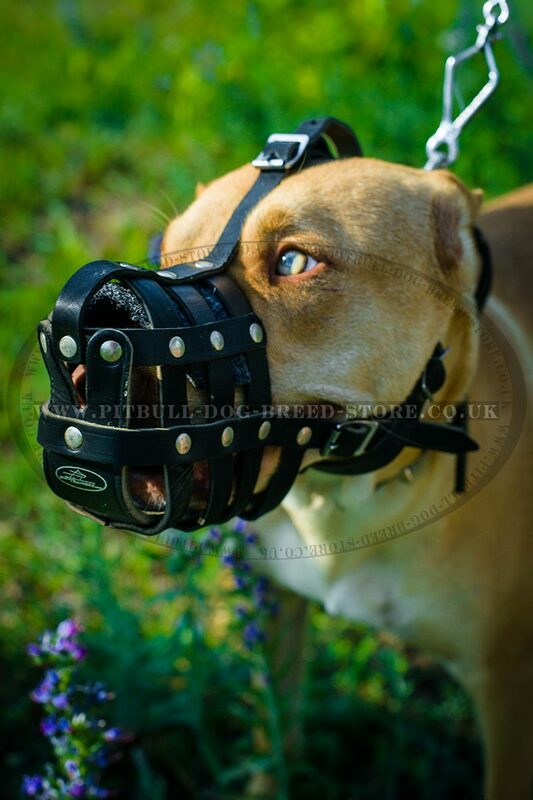 Use this padded dog muzzle when you're going to walk, train, visit a vet or transport Pitbull. It won't rub the dog's snout because of felt lining on nose area. 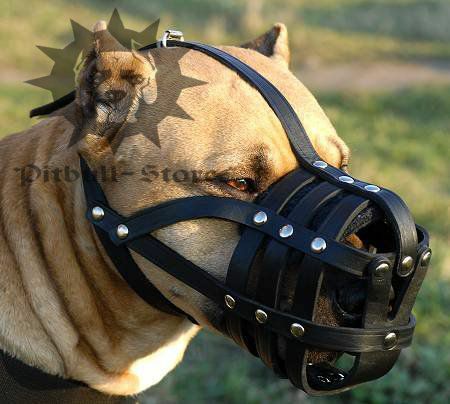 It will be extremely difficult for Pitbull to put off the padded dog muzzle if it is properly fitted. 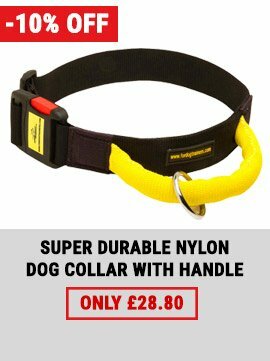 But the dog won't try to do it because of the muzzle inconvenience, only if it didn't get used to such a dog accessory. Carefully stitching and riveting are for additional durability. You can get one of the best dog outfits for your Pitbull in our online shop! Note: leather goods do not lose their royal look with proper care and the main thing here is to prevent water contact. Use special oils for leather care and you will be surprised with always qualitative look even after many years of use by your active Pitbull. 1. Hello! I received my dog muzzle super quick all the way over in Ireland. I'm really impressed with the service and the quality of the leather muzzle. I'll definitely will order again and again. Thanks again. 2. Ladies and Gentlemen! We've already ordered 3 dog muzzles from your site and we would like to share with you HOW you had eased our everyday life with our girl! 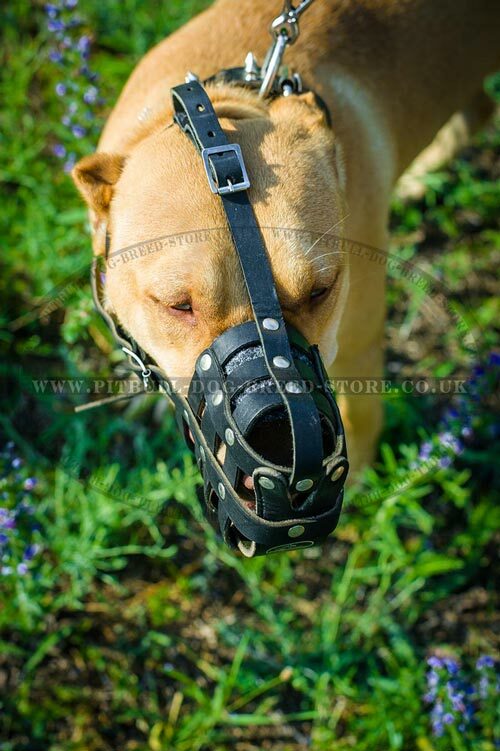 The dog muzzle fits perfectly, excellent working and the model itself was designed in such a way, that it's impossible for the dog to take it off. A thousand thanks to you!!! We've already recommended your site for many times!!! We wish you to have a great weekend from the heart! 3.Dear Pitbull-dog-breed-store-team, my order was delivered on the 21st of September, 2015. Everything is OK. Thank you very much. 4.Hello, yesterday we received the muzzle M41R, thank you a lot. We are absolutely satisfied and we would like to leave a high appraisal, but didn't find how to it on your site. Have a nice weekend. Greetings from Oberrhausen. 5.Hello, the new muzzle has come and we are absolutely satisfied. It fits perfectly, good processing and padding. The leather is pleasantly soft, but it's rather strong. Prince gets enough air. The muzzle does not rub and does not tighten, so the dog does not try to put it off. The muzzle looks great, due to the buckle it is easy to put on and off. This muzzle is the third in the life of our dog Prince (he is 1.5 years old), but it is the first that have impressed me. Thank you very much. When the dog will grow-up, we will order the next muzzle in your store without fail. The price is worth it, because the other 2 muzzle didn’t fit so well, despite the price of 50 Euros and a custom-made. Wait the next purchase! The best way to save this royal leather muzzle in its initial condition is lubrication with our Leather Care Balsam. Hello, the new muzzle has arrived and we are absolutely delighted. It fits ideally, perfect processing and lining, it is pleasantly soft, but solid at the same time. Prince gets enough air, it doesn’t press and doesn’t rub, that’s why he doesn’t try to put it off. Besides, the muzzle looks greatly and it is put on and off easily due to the quick release buckle. This muzzle is already the third in the Prince’s life (he is 1.5 years old), but it is the first that impresses. Thank you very much, when his head becomes wider we will 100% order the next one at your store, that’s for sure. This muzzle is good value for money, because two other muzzles cost 50 euro, but they didn’t fit as good as this one, despite of measurements. Until next purchase!